As a USD$70-75 billion market that has been growing steadily at 5-7 percent over the last few years, contact center outsourcing (CCO) has captured the interest of multiple non-CCO specialist service providers in the recent years. In fact, the more generalized ITO and BPO providers that have started CCO operations in the last decade have realized appreciable growth and success in recent years, some of them outdoing the market growth and growing in excess of 8 percent CAGR. However, it’s not been an easy journey for these relatively new entrants, given their relative small scale and scope of operations compared to the incumbent players, some of which make billions in revenue through contact center services alone and have operations across all major geographies. To differentiate themselves, these new players have tried to stand out from crowd through innovation, and by tapping areas within the CCO space that have showed the maximum growth in the last few years and have emerged as value propositions for CCO clients. Most of these high-growth players are, in fact, relatively smaller players, such as Genpact, HCL, HGS, TCS, and WNS. While many have had long-standing contact center capabilities, it has only been more recently that these firms have taken a more strategic go-to-market approach to pursuing the stand-alone CCO market. Their revenues from CCO operations are in the USD$100-450 million range, which is miniscule in size when compared to some of the bigger players such as Convergys and Teleperformance. 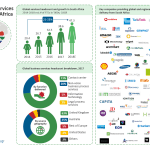 To sustain their above market growth, these providers have adopted multiple steps to emerge as serious contenders. Instead of merely tapping the traditional CCO markets such as North America and Europe, these players have aggressively expanded their footprint in emerging buyer geographies such as Asia Pacific, Eastern Europe, and Middle East & Africa. By building their capabilities in languages specific to these areas, they have been able to cater to client demands better. They have also been making their presence felt in some of the fastest growing verticals in the CCO market, such as retail, healthcare, and travel & hospitality. 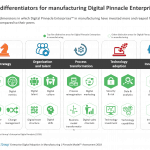 Many of them have effectively leveraged their organization’s overall investments in vertical industry expertise to further enhance CCO capabilities and offerings. A key differentiator for many of these players is their ability to link the consumer interaction in the contact center with downstream industry-specific processes by delivering front-back office integrated solutions. These investments seem to have paid off well, as the revenues from these verticals have shown sharp growth for these service providers. Our research shows that buyers are looking more towards building deeper working relationships with fewer CCO service providers. This means that buyers no longer expect service providers to just deliver on SLAs, but are looking for value beyond labor arbitrage. More contracts being signed now involve value-added processes, and include non-voice channels such as email, chat, and social media. To address these new value propositions, these high-growth players have invested in multiple technologies to build their capabilities in these domains. Most of them have leveraged their vast IT and BPO expertise to deliver solutions specific to contact center needs. They have also made it a priority to focus on building strong relationships with their clients. They have performed quite strongly on Everest Group’s buyer satisfaction survey, and have frequently been cited for their flexibility, responsiveness, consistency, and execution. With buyers looking to consolidate their portfolio of work with fewer strategic partners, it becomes more essential to have a stronger client-service provider relationship, which the service providers can only achieve by walking that extra mile to keep clients happy with their services. 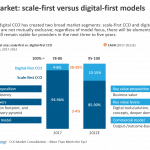 With the changing scenario in the CCO market, where the focus has shifted from improving the bottom line to adding more value to the operations and thus improving the top line for clients, scale can no longer be considered the primary metric for assessing a service provider. The focus has shifted to cost savings through process improvement and business outcomes, and this provides these relatively new generation high-growth players enough opportunity to prove their mettle in the market where they have been aligning their capabilities with changing client needs. Everest Group’s findings show that clients are taking notice and giving these providers a chance to prove themselves.